Few people would dispute the fact that our country has a broken immigration system. More than 11 million people are living in the United States without legal status, millions of people are waiting to be reunited with their families, and employers are not able to recruit the foreign-born workers our economy needs. But the effects of this broken system extend beyond immigrant workers, their families, and employers; all American workers are harmed by the nation’s dysfunctional immigration policies. Specifically, they are harmed because our immigration system undermines the employment protections of immigrants and subsequently erodes the effectiveness of employment laws for all workers. To fully understand why American workers are harmed, one must first consider the role of immigration enforcement in the workplace and how it affects the employment rights of immigrant workers. Under current immigration law, it is illegal for employers to knowingly hire undocumented workers. Despite this prohibition, unscrupulous employers use workers’ undocumented status to avoid compliance with employment laws and deter them from filing formal employment complaints with federal agencies. Many of these employers have therefore managed to go unpunished for their unlawful employment actions. The enforcement of employment laws is triggered primarily by employees who file formal complaints with federal agencies charged with employment-law enforcement. Therefore, when immigrants are unable to invoke their labor and employment rights, the overall effectiveness of employment laws also declines, as fewer employers are punished for their unlawful employment actions. This means that American workers are more susceptible to workplace violations such as wage and hour violations or unsafe working conditions. Passing common-sense immigration reform—such as the Border Security, Economic Opportunity, and Immigration Modernization Act, or S. 744, passed by the Senate on June 27—will fix this problem. This issue brief reviews the current state of our immigration system and explains how a broken system undermines immigrants’ employment rights and subsequently harms American workers. The brief then highlights how immigration reform, which legalizes the undocumented population and fixes our immigration system, will strengthen immigrants’ employment rights and in turn provide Americans with safer workplaces. The intersection of immigration and employment law in the modern era dates back to the Immigration Reform and Control Act of 1986, or IRCA. Prior to IRCA, the United States, like many other countries, relied on border security and deportations to deter and stop unlawful migration. When IRCA was enacted, our immigration policy shifted to include an enforcement strategy located at the point of hire. Congress thought that if undocumented immigrants could not secure employment, people would not migrate unlawfully to the United States. One of IRCA’s aims, therefore, was to eliminate economic opportunities for undocumented immigrants through the use of employer sanctions. For the first time, all new hires had to demonstrate their authorization to work in the United States by producing documents such as a Social Security Card and driver’s license and filling out the Employment Eligibility Verification Form I-9. This form certifies that the employer has reviewed a worker’s personal documents that verify the worker’s employment authorization. If U.S. Immigration and Customs Enforcement, or ICE, finds that an employer knowingly hired an undocumented immigrant, the employer will be subject to penalties such as fines and potential jail time. Including these provisions in IRCA was significant because it made the workplace an integral part of our country’s immigration-enforcement scheme. While employer sanctions seemed in theory to be a logical way to eliminate the incentives driving undocumented immigration, IRCA’s provisions did little in practice to eliminate economic opportunities for undocumented immigrants, for a variety of reasons. First, the employer sanctions were rarely enforced in the years immediately following IRCA, and employers were therefore only minimally deterred from hiring undocumented workers. Within the first decade following IRCA’s passage, the number of employers audited each year peaked at 10,000 in 1990, and the number of employers fined each year never exceeded 1,000. In the few cases where employers were fined for hiring undocumented workers, the punishments amounted to little more than a slap on the wrist. Secondly, the way in which employer sanctions were crafted created an opportunity for employers to technically comply with IRCA while still hiring undocumented immigrants. As discussed above, employers are penalized if they “knowingly” hire an undocumented worker. But since employers are only required to confirm that documents appear “on their face” to be valid—and many documents can be forged—some employers who in good faith complete the I-9 form still end up unknowingly hiring undocumented workers. Other employers, though, take advantage of this problem and use it as an opportunity to avoid liability under IRCA by completing an I-9 form while knowing that they are hiring undocumented workers. This type of compliance in name only is perpetuated by the fact that many employers and industries rely heavily upon immigrant labor. Finally, and most importantly, IRCA failed to deter undocumented migration because Congress failed to recognize that workplace enforcement on its own was not enough to halt undocumented migration into the country. For example, IRCA contained no provision for future worker visas. The law ignored the yawning gap between employer demands for workers and the ample supply of such workers in countries south of the United States. In short, it ignored the existence of an integrated, albeit unregulated, North American labor market. In the absence of any new means to enter the country legally, the push and pull of supply and demand led inevitably to more undocumented immigration in the decades following IRCA. Nearly 30 years after IRCA’s unsuccessful attempt to establish a realistic, effective immigration policy, it is little surprise that there are currently 8 million undocumented immigrants working in the United States, a figure that amounts to about 5 percent of the nation’s workforce. This large unauthorized population significantly hampers the effectiveness of our labor and employment laws and American workers. The nation’s employment and labor laws extend to and protect all employees. Since a person’s immigration status does not affect whether he or she is deemed an employee under these laws, workers are legally entitled to receive protection under labor and employment laws regardless of their immigration status. As immigration enforcement has entered the workplace under IRCA, however, there has been an increasing gap between the labor and employment rights of undocumented workers on paper and their ability to execute those rights in the workplace. In the landmark Hoffman Plastic Compounds Inc. v. NLRB decision in 2002, the U.S. Supreme Court ruled that undocumented immigrants are not entitled to back pay and reinstatement under the National Labor Relations Act, or NLRA. The Court argued that allowing undocumented immigrants to receive full remedies under the NLRA would undermine IRCA’s objectives of eliminating undocumented employment and discouraging future undocumented immigration. Since this decision, some lower courts have made similar rulings regarding undocumented immigrants’ rights under other employment laws, such as Title VII of the Civil Rights Act of 1964, which contains federal anti-discrimination provisions. On the whole, however, courts and executive agencies that enforce employment laws, such as the Equal Employment Opportunity Commission, have narrowly interpreted the Hoffman Plastic decision and have not extended it to other labor and employment laws. In one federal case, for example, an employer who had previously never abided by his I-9 form obligations only started requiring employees to fill out I-9 forms after a union organizing campaign began. The employer, citing compliance with IRCA, fired a majority of the workers—some documented, others undocumented—who were involved in the organizing campaign. Yet the employer only chose to fire those involved in the union campaign, even if other workers could not prove their work authorization. This case is a clear example of an employer wrongfully using his or her immigration-related duties to attempt to deter employees from invoking their labor-organizing rights. In another reported federal case, an undocumented employee filed an employment complaint after experiencing wage and hour violations. The employer told the employee that he would contact the Immigration and Naturalization Service, or INS— the precursor to the Department of Homeland Security—if the employee did not drop the complaint. The employee refused, and the employer contacted INS, which took the employee into custody for almost 16 months. In this case, the employer, while not required to call INS under IRCA, was able to use his knowledge of the employee’s immigration status to retaliate against the employee for invoking his employment rights. These two cases are by no means outliers. 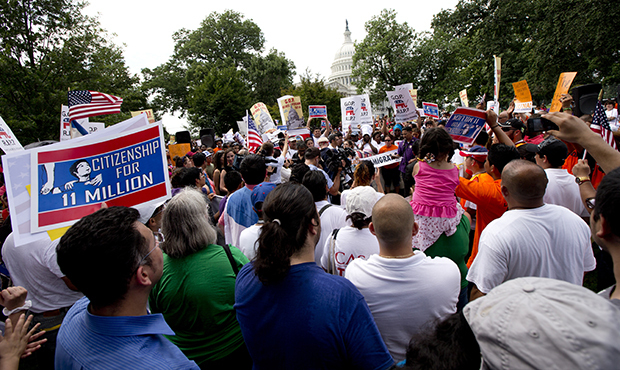 Employers regularly trigger immigration-enforcement actions as a means to chill immigrants’ employment rights. One study that investigated the overlap between workplace immigration-related raids and labor inspections found that out of the 184 workplaces in New York City that ICE investigated over a 30-month period, 102 were also subject to employment-related investigations. This widespread overlap suggests that employers are using the presence of immigration enforcement as a means to escape liability under labor and employment laws. While it is unclear whether, in each of these cases, employers triggered the immigration investigations after labor investigations began or the investigations were simply a coincidental overlap, the takeaway is still the same: Employers are able to avoid employment-law liability. In the United States, labor investigations, while usually trigged by a single employee, often rely upon other employees to prove that an employer is guilty of unlawful employment actions. Thus, if employers can create an environment in which employees fear deportation, the employees may be less likely to cooperate with labor investigations, and the employer can potentially avoid liability under employment laws—even if a complaint has already been filed. To be sure, the National Labor Relations Board, or NLRB, and many courts have ruled that it is unlawful for employers to use or go beyond their immigration-related duties to retaliate against employees who invoke their employment rights. Given that it takes a long time to adjudicate a retaliation claim, however, an employer may still successfully undermine employees’ labor and employment rights, despite eventually being punished for their retaliation. An employer can, for example, successfully dissuade employees from joining a union organizing campaign by illegally threatening to call ICE, long before the employer is punished or ordered to stop making such threats. In many ways, the penalty for engaging in retaliatory actions is simply the cost to an employer of avoiding a more undesirable employment outcome, such as a unionized workplace. Over the past few years, the Departments of Labor and Homeland Security have recognized this strategy and taken measures to lessen the negative consequences of our immigration system on the effectiveness of labor and employment laws. In 2011, the two departments renewed a Memorandum of Understanding, or MOU, regarding immigration- and employment-enforcement activities in the workplace. One aim of the MOU, for example, is to limit ICE investigations in the workplace when a labor dispute is ongoing. This MOU, however, is not a complete solution to the underlying problem. It is simply one way to mitigate the impact of a broken immigration system on our labor and employment laws. The problems that arise from a broken system can only be fully rectified when the system itself is fixed. Bad-apple employers who knowingly use immigration-related duties to exploit workers represent the most extreme way in which aspects of our immigration system can undermine workers’ employment rights. But the immigration system at large also has negative consequences for immigrant workers. Some immigrant employees who are not directly threatened with immigration-related retaliation by their employers, for example, are still hesitant to bring forth employment-related complaints because of the chilling effect our immigration system has had on them. Given how our immigration system has damaged immigrants’ ability to protect themselves from employment violations, it is not surprising that undocumented immigrants are some of the most exploited workers in our economy. A 2010 National Employment Law Project, or NELP, study of low-wage industries in major U.S. cities found that undocumented immigrants were nearly twice as likely to experience minimum-wage violations than legal immigrant workers. Specifically, NELP found in its study that 29 percent of undocumented male workers and 47 percent of undocumented female workers experienced minimum-wage violations, compared to 17 percent and 18 percent of native-born male and female workers, respectively. These findings are noteworthy because they highlight significant labor-protection gaps connected to immigration status and gender, meaning that undocumented women are some of the most exploited workers in our labor market. The employment rights of immigrant workers are most directly undermined by our broken immigration system. But the weak employment protections afforded to immigrants have serious implications for the effectiveness of our employment laws and all American workers. In the United States, the enforcement of employment laws hinges on individual employees bringing formal claims against unscrupulous employers. An investigation or lawsuit against an employer is most often triggered by an individual employee making a formal complaint with a federal agency charged with enforcing labor and employment laws. Thus, it is only through employees invoking their right to file claims that employers are punished for their unlawful actions and other employers are possibly deterred from engaging in similar behavior. Given this system of enforcing labor and employment laws, it is not enough to simply declare that all workers are covered under labor and employment laws. The workers covered by these laws need to be able to assert their rights in order for employment laws to be effective at securing safe and fair working conditions. Immigrants’ inability to invoke their rights results in weakened employment protections for all American workers—and in some instances, means that American workers are subject to violations of minimum-wage and overtime protections, wage theft, and other forms of employment violations, such as unsafe working conditions. In New York City, for example, many workers in the retail industry—specifically, in low-end discount stores—are immigrants who lack legal status. A 2007 study by the Brennan Center for Justice at New York University School of Law of low-wage workers in New York City found that retail workers faced pervasive workplace violations, including discrimination based on immigration status and immigration-related retaliation. These employment violations against immigrants have consequences for other American workers in the industry, evidenced by the fact that the typical hourly wage for all workers in low-end discount stores is at most $6.00. What’s more, workers are rarely if ever paid overtime, despite working more than 50 hours a week. This story is not unique to the retail industry or to New York City. All across America, employers are able to take advantage of U.S. workers by using our immigration system to exploit immigrant and undocumented workers. Moreover, given that many of the workers in these industries are immigrants, no matter how hard American workers try to lodge complaints against their employers, the widespread exploitation of undocumented workers will still result in poor wage and working conditions for the industry as a whole. This research supports the view that it is the broken immigration system, not the immigrants themselves, which leads to unlawful employment practices. An earned pathway to legal status and citizenship would diminish exploitation by eliminating employers’ ability to leverage a worker’s undocumented status against them. Workers subject to unlawful employment conditions will be more likely to step forward after legalization and lodge complaints, given that they can receive the full set of remedies and will no longer be chilled by a fear of deportation. Moreover, S. 744 utilizes a variety of tactics—from border security to improved employer-sanction provisions—to eliminate future undocumented immigration. One key component of achieving this goal is the elimination of any incentive employers have to hire undocumented workers. As discussed earlier, the Hoffman Plastic decision effectively inoculated some bad-faith employers from exploiting undocumented workers. The Senate bill tackles this perverse incentive by legislatively overturning the Hoffman Plastic decision. S. 744 would extend back pay and other employment remedies— except reinstatement—to undocumented workers. By requiring equal treatment under employment laws, S. 744 will not only improve working conditions for all Americans, but it will also deter future undocumented immigration by removing an incentive for unscrupulous employers to employ unauthorized workers. Another major component of S. 744 is the implementation of E-Verify. This electronic verification system, operated by the government, minimizes employers’ role in assessing whether an employee is authorized to work. Because E-Verify will be mandatory for all businesses, bad-apple employers will no longer be able to intentionally hire undocumented workers and then threaten to use the employment-verification system as a means of intimidation. In short, under E-Verify, employers will be less likely to leverage immigration status against employees as a means to avoid compliance with employment laws. To be sure, some employers will deliberately continue to employ unauthorized workers by staying off the grid. But those business owners, when exposed, will no longer be able to hide behind the veil of partial I-9 compliance and ambiguous requirements that enables employers to game the system today. If they are not running their new hires through E-Verify, they will be held accountable for deliberately violating the immigration laws and face steep civil or criminal sanctions. This change, over time, will create a strong compliance incentive. After employer-sanction laws were enacted in 1986, various reports—including a study by the nonpartisan General Accounting Office, now known as the Government Accountability Office—found that employers’ duty to determine who is authorized to work led to many instances of outright discrimination. As discussed, under IRCA, employers can be fined for knowingly hiring an undocumented immigrant. The GAO findings suggest that some employers, to preemptively avoid any possible liability under IRCA, used race as a heuristic when determining the work eligibility of employees—by simply refusing to hire anyone with a Latino-sounding last name, for example—instead of examining the Social Security cards, driver’s licenses, or other documents presented by employees. Shifting to an electronic verification system may significantly decrease the likelihood of employers discriminating against applicants on the basis of race or national origin. E-Verify is not completely accurate, however, and can occasionally result in employees being wrongly identified as ineligible for work. This has serious implications for Americans trying to secure employment. It is estimated that up to 3.5 million workers would have to visit the Social Security Administration to fix errors in the administration’s database, which E-Verify will use. But unlike previous attempts to implement E-Verify, S. 744 has put in place safeguards to protect workers from the system’s inaccuracy. Under S. 744, for example, it would be unlawful for employers to fire someone before they receive a final nonconfirmation notice through E-Verify and an employee has exhausted all available appeal processes. The Senate bill also makes it unlawful for employers to utilize E-Verify as a prescreening tool during the application process. One of the arguments that opponents of the Senate bill often cited was that immigrant workers on temporary visas would harm employment opportunities for American workers. While research shows that this is not the case, S. 744 nonetheless contains numerous safeguards to ensure that employers are not motivated to hire foreign workers out of a desire to exploit them or pay them less than they could an American worker. That is, S. 744 makes sure that employers do not sidestep employment laws while hiring visa workers. The Senate bill includes provisions that help ensure that employment and contract rights of visa workers are upheld. If employers have violated employment laws in the past two years, for example, they are not eligible to apply for the labor certification that allows them to hire temporary-visa workers. This requirement is important because it ensures that employers who have violated employment laws are not authorized to hire more vulnerable temporary workers. Employers who rely on such workers will have a strong incentive to comply with all employment laws. The ability to move freely throughout the labor market is a right most Americans take for granted. But a worker’s right to leave a job and find alternative employment creates an incentive for employers to treat employees fairly. That is, if an employer knows that an employee can seek employment elsewhere if they are mistreated, then the employer will be less likely to engage in this behavior in the first place. Thus, improving immigrants’ labor-market mobility will reduce immigrant exploitation. This indirectly affects American workers because as the number of unlawful employment actions taken against immigrants declines, a culture of employment-law compliance may be created that will ripple throughout many industries in the United States. Under the Senate bill, contract agricultural workers are provided with semi-labor-market portability. Workers who either serve until the end of their contract or until the employment relationship is mutually ended will be able to take another job—as long as it is within the agricultural industry and with a certified employer. Labor-market mobility is a small but significant step toward securing better working conditions for these agricultural workers, given that they are not protected by many of the basic employment laws in our country. Similarly, the creation of the “W” visa, which allows immigrants to work in nonagricultural, nonseasonal lower-skilled positions, also provides semi-labor-market portability. Like a contract agricultural worker, those in the United States on a W visa will be able to move freely between registered employers with registered available positions. More importantly, a W-visa holder will be able to apply for legal permanent residency through a new merit-based system. This would ultimately provide the former W-visa worker with full labor-market mobility. The detrimental effect our current immigration system has on American workers is a problem that is not often talked about, but workers all across America see it each day. Currently, our broken immigration system creates an opportunity for some employers to use the immigration status of workers to undermine their employment protections. This has serious implications for all workers in America. Our employment laws are strongest when all employees protected under them are able to invoke their rights when faced with workplace violations. A broken immigration system that stifles immigrants’ employment rights ultimately undermines the workplace safety of all American workers. By correcting our immigration system’s negative employment consequences, the Senate immigration bill—or similar reforms—would help protect American workers’ wages and ensure a safe and fair workplace. As the House of Representatives returns from recess, it should remember that taking up immigration reform will help not only more than 11 million aspiring Americans, employers across America, and the millions of families who are currently separated from their loved ones, but it will also help American workers as a whole. Adriana Kugler is a Senior Fellow at the Center for American Progress and a full professor of public policy at Georgetown University. Patrick Oakford is a Research Assistant with the Economic and Immigration Policy teams at the Center. The authors would like to thank Angela Kelley, Marshall Fitz, Philip E. Wolgin, and Ann Garcia for their helpful comments and suggestions.